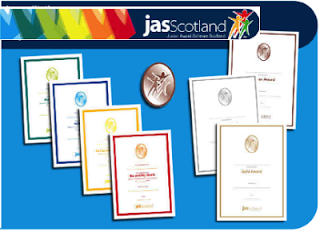 Each year we hold a whole day Conference for P7 pupils and this year the theme will focus on the Junior Award Scheme Scotland (JASS). Pupils will receive a free gym bag, fruit and a Dance workshop. Pupils should be dressed in clothing suitable for dance. Many thanks to the parents who have volunteered to assist with the soup making session in the GP Room Kitchen. JASS is theme this year. 9.00-9.15am Welcome - Aims - Expectations- Format for day including explanation of rotations. 10.25-10.40am Break (fresh fruit platters and water) All to bring own water bottle and take round workshops with them. 2.50- 3.10 PLENARY in Hall. Visitor Thanks. 3.10-3.20 Return to classrooms for coats and bags. Dismissal. Session Four - JUNIOR AWARDS SCHEME SCOTLAND (JASS) - Introduction, online questionnaire, planning how to gain accreditation, mind mapping on iPads - Jonathan Wallace and Ms Gallagher and JASS visitors. Introduction to eJASS. Mrs Barker's room. Session Five - ADVENTURE - Lagganlia 29th Sept - 3rd October. Brief review of residential - beginning at start of following week - and how it fits with JASS.